Computational number theory and modern cryptography are two of the most important and fundamental research fields in information security. 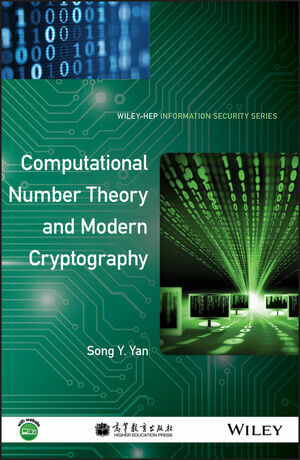 In this book, Song Y. Yang combines knowledge of these two critical fields, providing a unified view of the relationships between computational number theory and cryptography. The author takes an innovative approach, presenting mathematical ideas first, thereupon treating cryptography as an immediate application of the mathematical concepts. The book also presents topics from number theory, which are relevant for applications in public-key cryptography, as well as modern topics, such as coding and lattice based cryptography for post-quantum cryptography. The author further covers the current research and applications for common cryptographic algorithms, describing the mathematical problems behind these applications in a manner accessible to computer scientists and engineers. Computational Number Theory and Modern Cryptography is ideal for graduate and advanced undergraduate students in computer science, communications engineering, cryptography and mathematics. Computer scientists, practicing cryptographers, and other professionals involved in various security schemes will also find this book to be a helpful reference. Song Y. Yan is a Professor in the Department of Mathematics at the Massachusetts Institute of Technology (MIT) and Harvard University. Song is a computer scientist as well as a mathematician whose primary research interests are in the intersection of Mathematics/Number Theory and Computer Science/Information Technology, including areas such as Complexity Theory, Design and Analysis of Algorithms, Cryptography, and Information Security. He is a well-known author in the area, having published 5 books. He obtained a Doctorate in Mathematics (Number Theory) from the Department of Mathematics at the University of York, and majored in both computer science and mathematics.